Here, one of the minor Aesir, Høtherus, meets wood maidens who warn him that Balderus is a demi-god who cannot be killed by normal means. The Norse pantheon consisted of numerous minor dieties that were often overshadowed by the more famous gods such as Odin, Thor, Loki, and Freyja. Such Minor Aesir, however, still played important roles in the legends of Norse mythology. Whether secondary by virtue of their limited realm of influence (as was the case with Forseti and Nanna) or by their lack of extant sources (see Ull), these minor Aesir still reveal intriguing elements of the cultural and religious views of the early Nordic peoples. Norse Mythology is renowned for its rich tapestry of colorful stories, memorable characters, heroic sacrifice, and epic battles. In the history of northern Europe, this collection of tales brought meaning and purpose to both the Scandinavian peoples and the northern Germanic tribes for many centuries. Although the spiritual lore of Norse mythology, like much of human history itself, is violent, glorifying war and human sacrifice, this region has now become a leader of peace and disarmament on the international stage. The Scandinavian countries, unlike other world cultures, seem to have done a better job at evolving away from their ancient associations with belligerence and warfare to become leaders in promoting peace and diplomacy in our current age. As Norse deities, the Minor Aesir belonged to a complex religious, mythological, and cosmological belief system shared by the Scandinavian and Germanic peoples. This mythological tradition, of which the Scandinavian (and particularly Icelandic) sub-groups are best preserved, developed in the period from the first manifestations of religious and material culture in approximately 1000 B.C.E. until the Christianization of the area, a process that occurred primarily from 900–1200 C.E. The tales recorded within this mythological corpus tend to exemplify a unified cultural focus on physical prowess and military might. Though these gods play a smaller role than the major Norse deities, they still represent relevant aspects of the overall mythic tradition. More specifically, many of these figures exist primarily as personifications of abstract values (for example, Forseti) and are perhaps even more indicative of the overarching values of a people than the dominant figures of Odin and Thor. Forseti (Old Norse: "chairman"; Modern Icelandic and Faroese: "president") is the god of justice, peace, and truth among the Æsir. He was the son of Balder and Nanna. His home was Glitnir ("shining"), which referred to the hall's silver ceiling and golden pillars, radiating light that could be seen from a great distance. Forseti is the name of the son of Baldr and Nanna, daughter of Nep; he has that hall in heaven which is called Glitnir. All that come to him with such quarrels as arise out of law-suits, all these return thence reconciled. That is the best seat of judgment among gods and men. Since Forseti is not mentioned as a combatant at Ragnarok, it is assumed that, as a god of peace, he abstained from battle. In Frisia, the god is known as Fosite or Foseti and is thought to have been the chief god or ancestor of the Frisian people. The Norse view of the deity is related to the Frisian one, and is thought to have spread to them around 700 C.E., when the cultural relations between Frisia and southern Norway were amenable enough to enable the Fosite-cult to move north across the Oslofjord. She [Fulla] also is a maid, and goes with loose tresses and a golden band about her head; she bears the ashen coffer of Frigg, and has charge over her footgear, and knows her secret counsel. Hermóðr ("war-spirit") acts as Frigg's messenger after the death of Balder, sallying forth to Hel and attempting to secure the release of the beloved god. Now when the gods had come to themselves, Frigg spake, and asked who there might be among the Æsir who would fain have for his own all her love and favor: let him ride the road to Hel, and seek if he may find Baldr, and offer Hel a ransom if she will let Baldr come home to Ásgard. And he is named Hermódr the Bold, Odin's son, who undertook that embassy. As seen above, he is described (at least in the Prose Edda) as the All-Father's son (or at least his servant). However, some evidence (not least the fact that "Snorri never mentions Hermod in his lists of the Aesir") suggests that he is a euhemerized human hero rather than a deity. Höðr (often anglicized as Hod) is the blind brother of Balder, representing darkness and winter (as opposed to his brother's associations with lightness and spring). Guided by Loki, he shot the mistletoe arrow that came to slay the otherwise invulnerable Baldr. While most accounts of this tale follow the plan outlined in Snorri Sturluson's Prose Edda, an entirely different vision of the tale is presented in the Gesta Danorum of Saxo Grammaticus. Both will be explored below. One of the Æsir is named Hödr: he is blind. He is of sufficient strength, but the gods would desire that no occasion should rise of naming this god, for the work of his hands shall long be held in memory among gods and men. The blind god is not mentioned again until the prelude to Baldr's death is described. As a precursor to his demise, the Lord of Spring was allowing himself to be the target of various missiles, as all things (with the grievous exception of mistletoe [which was believed to be harmless]) have sworn an oath not to harm him. Loki took mistletoe and pulled it up and went to the Thing. Hödr stood outside the ring of men, because he was blind. Then spake Loki to him: "Why dost thou not shoot at Baldr?" He answered: "Because I see not where Baldr is; and for this also, that I am weaponless." Then said Loki: "Do thou also after the manner of other men, and show Baldr honor as the other men do. I will direct thee where he stands; shoot at him with this wand." Hödr took mistletoe and shot at Baldr, being guided by Loki: the shaft flew through Baldr, and he fell dead to the earth; and that was the greatest mischance that has ever befallen among gods and men. However, the Gylfaginning does not say what happens to Höðr after this. In fact, it specifically states that Baldr cannot be avenged, at least not immediately. Then, when Baldr was fallen, words failed all the Æsir, and their hands likewise to lay hold of him; each looked at the other, and all were of one mind as to him who had wrought the work, but none might take vengeance, so great a sanctuary was in that place. It does seem, however, that Höðr eventually ends up in Hel, for the last mention of him in Gylfaginning is in the description of the renewal of the world after the cataclysm of Ragnarök. After that Baldr shall come thither, and Hödr, from Hel; then all shall sit down together and hold speech with one another, and call to mind their secret wisdom, and speak of those happenings which have been before: of the Midgard Serpent and of Fenris-Wolf. Though Snorri does not relate the tale of Höðr's death at the hands of Váli, it is evident that he was familiar with it, as he includes "Foe of Váli" as a kenning for the Blind God and "Baldr's Avenger, [and] Foe and Slayer of Hödr" as kennings for Váli. The accounts of this event in the Poetic Edda (specifically the Völuspá and Baldr's Draumr) are essentially compatible with the version presented in the Prose Edda. In Gesta Danorum, Høtherus (Höðr) is a human hero of the Danish and Swedish royal lines, who is gifted in swimming, archery, fighting, and music. He first encounters Balder when they begin to compete for the hand of Nanna, daughter of Gewar, King of Norway. In this version, Balder was a demigod who could not be wounded by common steel. The two rivals encountered each other in a terrible battle, which eventually led to Balder being beaten and forced into exile. However, Balder, half-frenzied by his dreams of Nanna, in turn drove him [Hoether] into exile (winning the lady); finally Hother, befriended hy luck and the Wood Maidens, to whom he owed his early successes and his magic coat, belt, and girdle [there is obvious confusion here in the text], at last met Balder and stabbed him in the side. Of this wound Balder died in three days, as was foretold by the awful dream in which Proserpina (Hela) appeared to him. In this account, the divine character of the tale (and much of its mythic resonance) is stripped away in favor of an attempt at historical accuracy (or an attempt to discredit "pagan" practices). Hœnir's role in the Norse pantheon is both conflicted and uncertain. His list of kennings in the Prose Edda, which includes "Bench-Mate or Companion or Friend of Odin, the Swift of God, the Long-Footed, and King of Clay," does not help clarify his characterization to any great extent. On the one hand, he is present at many of the most important moments in the mythic timeline; on the other, he is depicted as an indecisive sycophant whose lack of practical utility leads to the death of his friend, Mímir. Ask and Embla, | empty of might. Heat gave Lothur | and goodly hue. In this Edenic setting, the god is seemingly gifted with the power of prophecy. In many other Eddic sources (including Haustlöng and Reginsmál), Hœnir is simply described as a constant traveling companion of Odin, Loki, and other prominent Aesir. Unlike these tales of his mythic importance, the depiction of Hœnir in the Ynglinga Saga is far less flattering. Chosen to be a hostage to the Vanir following the Aesir/Vanir war, he is given a chieftainship, due in large part to his manly and imposing appearance. Unfortunately, Hœnir proves to be an utterly incompetent leader who relies upon Mímir to make his decisions for him. The outraged Vanir responded to this by decapitating their intelligent hostage and sending his head to the Aesir. As in many other cases, these two views of Hœnir seem to be utterly incompatible, likely resulting from the gradual evolution of the mythic corpus. However, even this tale is not consistently assigned to this god. As Lindow notes in his description of the version of this tale in the Prose Edda, "[T]he creator gods in his version are the sons of Bor (i.e., Odin, Vili, and Vé). The third, who is structurally equivalent to Lódur, gives appearance, speech, hearing, and vision." Meili's brother, | and Magni's father." Likewise, Snorri often uses the kenning "Meili's brother" to refer to the God of Thunder. Aside from these oblique references, all other information concerning this god has been lost. Móði ("angry one") and Magni ("the strong") are the two sons of Thor, the former borne by Sif and the latter by Jarnsaxa (a giantess). They are best known as the inheritors of their father's potent mystical hammer, Mjolnir, after the cataclysm of Ragnarök. As Lindow notes, "Magni and his brother Móði are, then, second generation gods—like Vídar and Vali and Höd and Baldr—who will survive Ragnarök and participate in the new world order." Nanna is a goddess in Norse mythology, the daughter of Nep, the wife of Baldr, and the mother of Forseti. She and her divine husband dwell together in the hall of Breidablik. According to Gylfaginning, when Baldr was unintentionally slain by the blind god Höðr through the treachery of Loki, "her heart burst with grief, and she died." She was placed on the funeral pyre alongside her spouse on his ship Hringhorni, which was then launched out to sea. Later, when Hermód set out on his quest to bring Baldr back from the underworld and entered the hall of Hel, he saw Baldr there in the seat of honor alongside Nanna. The deceased goddess, who evidently still felt bonds of kinship with the surviving Aesir, sent gifts for the other gods, including a robe for Frigg and a ring for Fulla, back with Hermód. According to Skáldskaparmál, Nanna is listed among the eight Ásynjur (female Aesir) presiding over the banquet held for Aegir (a human visitor) when he was a guest in Asgard, though Baldr is conspicuously absent among the hosting male Æsir. 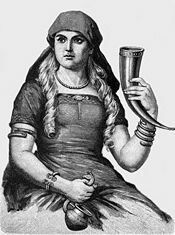 In Gesta Danorum, a Danish history written by Saxo Grammaticus (c. 1150–1220), Nanna is a beautiful human woman caught up in a love triangle between the human king Hotherus and the demigod Balderus, who, unlike their counterparts in Gylfaginning, are not brothers but rivals for the hand of the princess. Loki Laufeyarson, for mischief's sake, cut off all Sif's hair. But when Thor learned of this, he seized Loki, and would have broken every bone in him, had he not sworn to get the Black Elves to make Sif hair of gold, such that it would grow like other hair. After that, Loki went to those dwarves who are called Ívaldi's Sons; and they made the hair. By virtue of this tale, "Sif's hair" becomes a popular kenning for "gold" in the vocabulary of the skaldic poets. This illustration from an eighteenth-century Icelandic manuscript shows Ullr on his skis and with his bow. In Norse mythology, Ull is a son of Sif and a stepson of Thor. While extant sources are scant, he appears to have been a major god in prehistoric times (perhaps even a head of the Proto-Germanic pantheon). This historical importance is implied by many extant toponyms throughout Scandinavia and also by archaeological evidence (such as the the third-century C.E. Thorsberg chape [a fragmentary inscription recovered from a sword's scabbard]). One is called Ullr, son of Sif, step-son of Thor; he is so excellent a bowman, and so swift on snowshoes, that none may contend with him. He is also fair of aspect and has the accomplishments of a warrior; it is well to call on him in single-combats. In Skáldskaparmál, the second part of the Prose Edda, Snorri mentions Ullr again in a discussion of kennings. 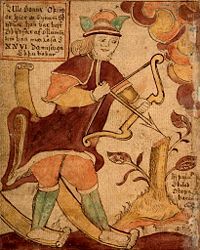 Snorri informs his readers that Ullr can be called ski-god, bow-god, hunting-god, and shield-god. In turn, a shield can be called Ullr's ship. However, and in spite of these tantalizing poetic allusions, Snorri relates no myths about Ullr, suggesting that the god has already faded from memory by the thirteenth century C.E. Snorri's note that a shield can be called "Ullr's ship" is borne out by surviving skaldic poetry, with kennings such as askr Ullar, far Ullar, and kjóll Ullar—all meaning Ullr's ship and referring to shields. While the origin of this kenning is unknown, it could be connected with the identity of Ullr as a ski-god. Early skis, or perhaps sleds, might have been reminiscent of shields. The name of Ullr is also common in warrior kennings, where it is used as other god names are. The name Ýdalir, meaning "yew dales," is not otherwise attested. However, the yew was an important material in the making of bows, and the word ýr, "yew," is often used metonymically to refer to bows. Thus, it seems likely that the name Ýdalir is connected with the idea of Ullr as a bow-god. Ull is also mentioned in the Atlakviða, where the hero swears an oath by "the ring of Ull." Given that both Atlakviða and Grímnismál are often considered to be among the oldest extant Eddic poems, it may not be a coincidence that they are the only ones to refer to Ullr. 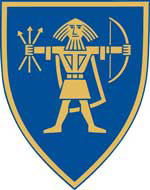 The coat of arms of Ullensaker displays Ullr as a charge. The name Ullr is probably cognate with the Old English word wuldor and the Gothic word wulþus, meaning "glory." The appearance of Ullr's name in numerous Danish, Norwegian, and Swedish place names (for example, Ulleråker or "Ullr's field" and Ullevi or "Ullr's shrine") is further evidence that Ullr had at some point a religious importance greater than is immediately apparent from the scant surviving textual references. In Norse mythology, Váli is a son of the god Odin and the giantess Rindr. He was birthed for the sole purpose of avenging Balder's death by slaying the blind (and arguably blameless) Höðr. As a testament to the singular purpose of his existence, some sources describe him growing to full adulthood and exacting his bloody revenge within a single day of his birth. Váli is also fated to survive Ragnarök. Till the slayer of Baldr | he brings to the flames. And one night old | fought Othin's son. Till he bore to the bale-blaze | Baldr's foe. For Valhall's need: would you know yet more? In Norse mythology, Víðarr (often Anglicised Vidar or Widar) is a god associated with vengeance. He is the son of Odin and the giantess Grid, whose major deed in the mythology is to avenge his father's death at Ragnarök. To that end, he is also one of the few gods destined to survive that final conflict. According to Gylfaginning, Vidar is described as follows: "He is the silent god. He has a thick shoe. He is nearly as strong as Thor; in him the gods have great trust in all struggles." During Ragnarök, when the wolf Fenrir devours Odin, Vidar will avenge him by treading down with one foot upon the lower jaw of the monster, grabbing his upper jaw in one hand and tearing his gullet asunder, killing him. Since Vidar's "thick shoe" consists of all the leather waste pieces that people have cut from their own shoes, anyone who is concerned enough to give assistance to the gods must throw these pieces away. Following Ragnarök and the rebirth of the world, Vidar (along with his brother Váli) will be two of the few surviving Aesir. According to Skáldskaparmál, when Aegir was a guest in Asgard, Vidar was one of the twelve presiding male gods seated among those hosting the banquet. Later in the book, various kennings are given for Vidar, including "the Silent God, Possessor of the Iron Shoe, Foe and Slayer of Fenris-Wolf, Avenger of the Gods, Divine Dweller in the Homesteads of the Fathers, Son of Odin, and Brother of the Æsir." The selections in the Poetic Edda that describe Vidar are more or less compatible with Snorri's account (as summarized above). John Lindow, in his Handbook of Norse Mythology (2001), speculates that Vidar's silence may be due to a ritualized abstention or vow—practices that often accompany acts of vengeance. 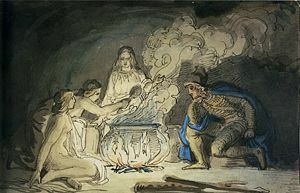 A similar case can be seen in Völuspá and Baldrs draumar, where Váli, conceived for the sole purpose of avenging Balder's death, abstains from washing his hands and combing his hair "until he brought Baldr's adversary to the funeral pyre." According to H. A. Guerber's Myths of the Norsemen, Vidar is considered to be a reflection of the primeval forest. His home was Landvidi ("wide land"), which was said to be surrounded by thick vegetation deep in the woods where he could meditate in silence. When the sons of Borr [Odin, Vili, and Vé] were walking along the sea-strand, they found two trees, and took up the trees and shaped men of them: the first gave them spirit and life; the second, wit and feeling; the third, form, speech, hearing, and sight. They gave them clothing and names: the male was called Askr, and the female Embla, and of them was mankind begotten, which received a dwelling-place under Midgard. Given that this same tale is told in the Völuspá with Vili replaced by Hœnir and Vé by Lóðurr, it seems likely that the two pairs are, in some way, analogous. Both in thy bosom have lain." ↑ Lindow, pp. 6–8. Though some scholars have argued against the homogenizing effect of grouping these various traditions together under the rubric of “Norse Mythology,” the profoundly exploratory/nomadic nature of Viking society tends to overrule such objections. As Thomas DuBois cogently argues, “[W]hatever else we may say about the various peoples of the North during the Viking Age, then, we cannot claim that they were isolated from or ignorant of their neighbors…. As religion expresses the concerns and experiences of its human adherents, so it changes continually in response to cultural, economic, and environmental factors. Ideas and ideals passed between communities with frequency and regularity, leading to an interdependent and inter-cultural region with broad commonalities of religion and worldview.” (27–28). ↑ More specifically, Georges Dumézil, one of the foremost authorities on the Norse tradition and a noted comparatist, argues quite persuasively that the Aesir / Vanir distinction is a component of a larger triadic division (between ruler gods, warrior gods, and gods of agriculture and commerce) that is echoed among the Indo-European cosmologies (from Vedic India, through Rome, and into the Germanic North). Further, he notes that this distinction conforms to patterns of social organization found in all of these societies. See Georges Dumézil's Gods of the Ancient Northmen (especially pp. xi–xiii, 3–25) for more details. ↑ Snorri Sturluson, Gylfaginning XXXII, Brodeur 41. ↑ Orchard, 116. See also de Vries, who discusses the spread of the cult. (Altgermanische Religionsgeschichte, band II, Berlin, 1957). ↑ Snorri Sturluson, Gylfaginning XXXV, Brodeur 46. ↑ Snorri Sturluson, Gylfaginning XLIX, Brodeur 72. ↑ Lindow, 173; Orchard, 191. ↑ The name Höðr is thought to be related to höð, "battle," and mean something like "killer." This would seem to fit with the god's mythological role. In the standardized Old Norse orthography, the name is spelled Hǫðr but the letter "ǫ" is frequently replaced with the Modern Icelandic "ö" for reasons of familiarity or technical expediency. The name can be represented in English texts as Hod, Hoder, Hodur, Hodr, Hödr, Höd, or Hoth or less commonly as Hödur, Hödhr, Höder, Hothr, Hodhr, Hodh, Hother, Höthr, Höth, or Hödh. In the reconstructed pronunciation of Old Norse, Höðr is pronounced IPA: ['hɔðr] (♫) while the Icelandic pronunciation is IPA: ['hœðʏr] (♫), corresponding to the Icelandic spelling Höður. The various anglicizations are pronounced in an ad hoc fashion according to the taste and dialect of the speaker. ↑ Snorri Sturluson, Gylfaginning XXVIII, Brodeur 40. ↑ Snorri Sturluson, Gylfaginning LIII, Brodeur 83. ↑ Snorri Sturluson, Skáldskparmal XII, XIII, Brodeur 114. ↑ Saxo Grammaticus, The Danish History (Introduction II: Gods and Goddesses), translated by Oliver Elton (New York: Norroena Society, 1905). Accessed online at The Online Medieval and Classical Library. Retrieved January 23, 2009. ↑ Snorri Sturluson, Skáldskaparmal XV, Brodeur 114. ↑ It should be noted that Hœnir and and Lodúr are replaced by Vili and Vé (both discussed below). "Völuspá" (17–18), Poetic Edda, 8. Retrieved January 23, 2009. ↑ Völuspá" (62–63), Poetic Edda, 25. Retrieved January 23, 2009. ↑ Ynglinga Saga (4), Online Medieval and Classical Library. Retrieved January 23, 2009. ↑ "Völuspá" (17–18), Poetic Edda, 8. Retrieved January 23, 2009. ↑ Munch, 10. Lindow, 227. ↑ Harbarthsljoth (9), Poetic Edda, 125–126. Retrieved January 23, 2009. ↑ Snorri Sturluson, Skáldskaparmal XVII, XXII, XXIII, Brodeur 119, 131, 134. ↑ See, for example, Snorri Sturluson's Gylfaginning LIII, Brodeur 83. ↑ Snorri Sturluson, Gylfaginning XLIX, Brodeur 73. ↑ Snorri Sturluson, Gylfaginning XLIX, Brodeur 73–75. ↑ Snorri Sturluson, Skáldskaparmál I, Brodeur 89. ↑ Snorri Sturluson, Skáldskparmál XXXV, Brodeur 145. ↑ See First Period Inscriptions. Retrieved January 23, 2009. ↑ Snorri Sturluson, Gylfaginning XXXI, Brodeur 41. ↑ Snorri Sturluson, Skáldskaparmál XIV, XLVIII; Brodeur, 114, 182. ↑ Turville-Petre, 182 and 309 ff. 4. ↑ See Bellows, p. 88 ff 5 (in his translation of the Poetic Edda). Retrieved January 23, 2009. ↑ "Atlakviða En Gronlenzka" 32, Poetic Edda, 494. Retrieved January 23, 2009. ↑ "Baldr's Draumar" 11, Poetic Edda, 198–199. Retrieved January 23, 2009. ↑ "Völuspá" 33-34, Poetic Edda, 15. Retrieved January 23, 2009. ↑ Snorri Sturluson, Gylfaginning XXIX, Brodeur 41. ↑ Snorri Sturluson, Gylfaginning LI, Brodeur 80. ↑ Snorri Sturluson, Skáldskaparmál XI, Brodeur 113–114. ↑ "Baldr's Draumar" 11, Poetic Edda, pp. 198–199. Retrieved January 23, 2009. ↑ Snorri Sturluson, Gylfaginning VII, Brodeur 19. ↑ Snorri Sturluson, Gylfaginning IX, Brodeur 21. ↑ "Lokasenna" (26), Poetic Edda, 160. Retrieved January 23, 2009. Bellows, Henry Adams (trans.). The Poetic Edda. Princeton: Princeton University Press, 1936. Available online. Retrieved January 23, 2009. Brodeur, Arthur Gilchrist (trans.). The Prose Edda by Snorri Sturluson. New York: The American-Scandinavian Foundation, 1916. Available online. Retrieved January 23, 2009. Björnsson, Eysteinn. Lexicon of Kennings: The Domain of Battle. 2001. Published online: http://www.hi.is/~eybjorn/ugm/kennings/kennings.html. Retrieved January 23, 2009. Björnsson, Eysteinn (ed.). Snorra-Edda: Formáli and Gylfaginning: Textar fjögurra meginhandrita. 2005. Published online: http://www.hi.is/~eybjorn/gg/. Retrieved January 23, 2009. Björnsson, Eysteinn (ed.). Völuspá. Published online: http://www.hi.is/~eybjorn/ugm/vsp3.html. Retrieved January 23, 2009. Jónsson, Finnur. Lexicon Poeticum, "Ullr." København: S. L. Møllers Bogtrykkeri, 1931. Entry available online at Lexicon Poeticum. Retrieved January 23, 2009. Jónsson, Guðni (ed.). Eddukvæði: Sæmundar Edda. Reykjavík: Íslendingasagnaútgáfan, 1949. Available online. Retrieved January 23, 2009. Saxo Grammaticus, Gesta Danorum, Books I-IX, translated to English by Oliver Elton, 1905. Retrieved January 23, 2009. Saxo Grammaticus, Gesta Danorum, from the Royal Library in Copenhagen, Danish and Latin. Retrieved January 23, 2009. Sturluson, Snorri. The Prose Edda. Translated from the Icelandic and with an introduction by Arthur Gilchrist Brodeur. New York: American-Scandinavian Foundation, 1916. Available online. Retrieved January 23, 2009. Thorpe, Benjamin. (trans.). Edda Sæmundar Hinns Froða: The Edda of Sæmund the Learned. (2 vols.) London: Trübner and Co., 1866. (HTML version available at Northvegr: Lore: Poetic Edda - Thorpe, trans.). Retrieved January 23, 2009. This page was last modified on 23 November 2009, at 17:10.